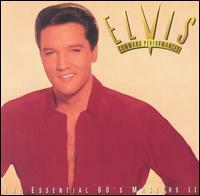 Command Performances: The Essential 60s Masters II is a two-disc compilation of studio master recordings by American singer and musician Elvis Presley during the decade of the 1960s, released in 1995 on RCA Records, catalogue number 66601-2. It also includes a booklet with session details and an essay by Susan M. Doll. The set comprises a selection of recordings made by Presley during the decade specifically at a session for the soundtrack of a feature film, of which Presley made 27 during the 1960s. These recordings were originally released in a variety of formats: LPs, EPs, and as sides of a single, and during the 1960s soundtrack songs appeared on 15 full-length long-playing albums, five EPs, and numerous singles. All of Elvis' movies are represented by at least one song in this set with the exception of Tickle Me, its EP soundtrack consisting of five previously issued studio recordings, all of which were included on the box set first volume of the Essential '60s Masters. The two discs present the studio masters in rough chronological session order. Two previously unreleased masters appear: a version of the Eddy Arnold song "You Don't Know Me" recorded during the sessions for the movie Clambake; and an alternate take of the song "Follow That Dream" as the stereo master for the original has been lost, and the compilers opted not to use the surviving mono master. The songs "Can't Help Falling in Love" and "Rock-A-Hula Baby" were released as, respectively, the A-side and b-side of a single following the release of the Blue Hawaii album, and went to #2 and #23 on the Billboard Pop Singles chart. "Puppet on a String" appeared as a single seven months after the release of the Girl Happy soundtrack, backed with "Wooden Heart" from G.I. Blues, and peaked at #14 on the singles chart. "Wooden Heart" had also been released as the flipside to a reissue of "Blue Christmas" eleven months earlier. RCA issued a box set for the complete non-gospel songs that were not recorded at soundtrack sessions during the decade, From Nashville to Memphis: The Essential 60s Masters, and released a similar two-disc set for the gospel recordings in 1994, Amazing Grace: His Greatest Sacred Performances. All selections recorded at Radio Recorders, Western Recorders, Paramount Recording Stage, MGM Studios, Samuel Goldwyn Studio, United Artist Recorders, Decca Universal Studio, and RCA Studios in Hollywood, RCA Studio B in Nashville, Tennessee. Original recordings produced by Joseph Lilley, Urban Thielmann, Hans Salter, Jeff Alexander, George Stoll, Gene Nelson, Fred Karger, Felton Jarvis, Billy Strange, Hugo Montenegro, Billy Goldenberg, and Leith Stevens. Discographical information below taken from Elvis Presley A Life in Music: The Complete Recording Sessions, by Ernst Jorgensen, St. Martin's Press, New York, 1998. Chart positions for LPs from Billboard Top Pop Albums chart; positions for singles and EPs from Billboard Pop Singles chart. By late 1968, Billboard discontinued charting B-sides. Titles listed without corresponding LP/EP designation were initially released as singles only. 17. "Girls! Girls! Girls!" Jerry Leiber, Mike Stoller 2:31 1962-03-27 1962-11-09 Girls! Girls! Girls! LSP 2621 #3 Girls! Girls! Girls! 18. "Because of Love" Ruth Batchelor, Bob Roberts 2:31 1962-03-27 1962-11-09 Girls! Girls! Girls! LSP 2621 #3 Girls! Girls! Girls! 19. "Return to Sender" Otis Blackwell, Winfield Scott 2:06 1962-03-27 1962-10-02 Girls! Girls! Girls! 47-8100 #2 Girls! Girls! Girls! 29. "Charro!" Billy Strange, Mac Davis 2:44 1968-10-15 1969-02-25 47-9731b Charro! ^ "Elvis Presley: Album Guide". rollingstone.com. Archived from the original on September 18, 2013. Retrieved June 20, 2015. This page was last edited on 16 October 2018, at 21:04 (UTC).